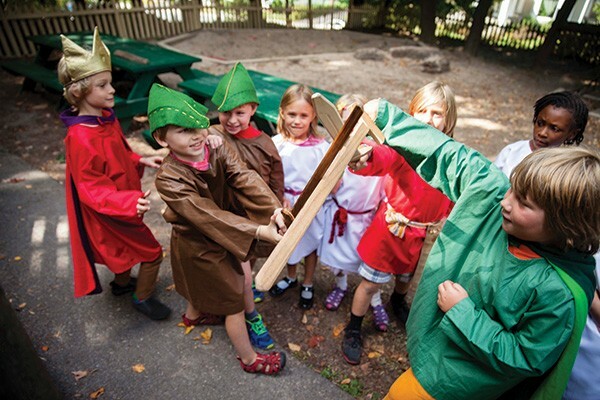 Students participating in the Games of Courage at Mountain Laurel Waldorf School in New Paltz. Thirty years ago, developmental psychologist and Harvard education professor Howard Gardner published Frames of Mind: The Theory of Multiple Intelligences. The book set off a depth charge underneath the comfortable Stanford-Binet IQ test-based academic world in which learning ability was widely regarded as binary—verbal and mathematical. Drawing on his research with both brain-damaged adults and "normal" child development, Gardner proposed that rather than two main areas of intelligence, there are eight: linguistic, logic-mathematical, musical, spatial, bodily/kinesthetic, interpersonal, intrapersonal, and naturalistic. Gardner was careful to make the distinction that what he had developed was a theory of developmental psychology and not a theory of education per se. Nevertheless, his thinking offered a breath of fresh air to a great many educators, validating and organizing as it did something many of them had long intuited about the failures of cookie-cutter instruction. "In the Waldorf movement, the reaction was a big 'Yay! Wonderful,'" says John Greene, head of faculty at Great Barrington Rudolph Steiner School in Great Barrington, Massachusetts. "It was a sense of recognition that what Rudolf Steiner [founder of Waldorf education] was trying to articulate has merit and was being more widely recognized. Any teacher worth their salt recognized learning differences and their importance, but what he did was break it down—very impressive." Though she's also quick to point out that Waldorf educators have been working from a multiple intelligence point of view for almost a century now, veteran GBRSS teacher Nancy Franco can reel off multiple examples that dovetail nicely with Gardner's work. "We work with all of these aspects every day, both individually and en masse—you could say that the Waldorf understanding of these concepts is very honed," she says. "They're important aspects of the human being that deserve to be experienced by all students. And since the Waldorf way involves working with the same group of students for eight or 12 years [students advance through the grades with the same teacher], we become very aware of how the individual modalities operate within the individual kids. We seek to utilize the strengths as learning tools, and to develop the areas that might need work." For example, Franco says, a Waldorf school day begins with a musical interlude. "We sing, play instruments, recite rhythmic verse, do clapping games. Those activities touch on and elicit linguistic, spatial, musical, kinesthetic and interpersonal intelligence—so in that 15 minute opener, you're looking at four or five of the intelligences right there." 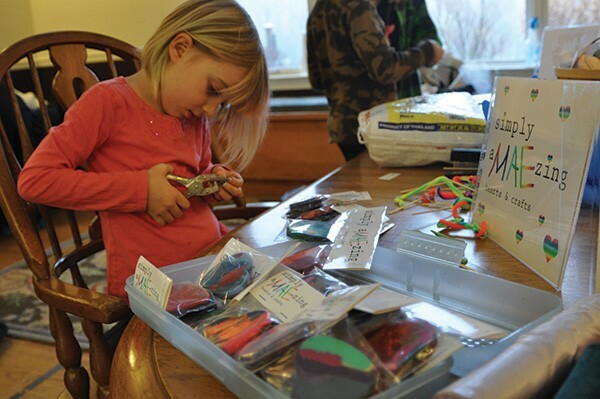 Mae Gallagher prepares crafts for the Hudson Valley Sudbury School’s craft sale. Gardner's work also finds a natural home at the Birch School in Rock Tavern, an innovative program of the Watershed Learning Center that has evolved from its founder's work with children in settings such as summer camp and homeschooler support. "Birch teachers and mentors create learning experiences that are engaging for different kinds of intelligences," says co-director Kate Fox. 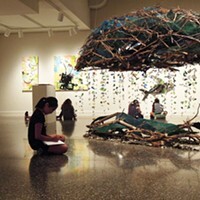 "Students try out their skills and discover which learning experiences work best for them. Students choose modalities that they have an affinity for. Information can be gathered for authentic assessment and used to inform further learning processes as the student progresses. They encourage students to reflect on their learning process and help students learn to identify what they are good at." What that looks like on the ground at Birch is, among other things, "a "Quarterly Student Showcase." "This provides an opportunity for students to display their learning in a variety of ways beyond paper," says Fox. "Student projects, videos, computer programs, sewing projects, posters, experiments, art projects, poetry, music, speeches, PowerPoint presentations, and more are all displayed for the school community to see. Showcase submissions in many modalities allow students to display their skills in the ways they are best at. At any given hour in a school day, some students are working in workbooks and journals, others are using online computer simulations. A group of students does multiplication practice and receives direct instruction in the lab. Some students use the listening center to hear lessons. Others are watching online video lessons. Small groups are playing math games. A student is playing an online drill program in the form of a video game. All Birch School students get plenty of outdoor time, and some students spend even more time outdoors, exploring science through nature study and exploration. Building, programming, robots, creating things, experimental archeology, and inventions are encouraged." Oakwood Friends School in Poughkeepsie is another place where Gardner's understanding is put to considerable use. "We teach to multiple intelligences in grades 6 through 12 all the time," says Anna Bertucci, Oakwood's upper school head and assistant head for academics and student life. "First of all, our emphasis on meaningful teacher-student interactions makes it possible to employ multiple strategies in the classroom. We know our students well and can give individual attention in our small classes. This means we know we have to create different educational experiences for different learners. 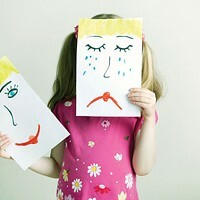 We also help students to get to know themselves as learners. Creating opportunities for learning through experience and helping individuals create their own meaning is at the heart of Friends education. "Also, as an independent school we have the freedom to design dynamic classes and curriculum. We not only present material through different modalities, we also assess students through a variety of means. For example, a student who is a kinesthetic learner might act out an important scene from history rather than demonstrate her knowledge in a multiple-choice test format. And with a 66-acre campus, we are able to get out of the classroom often. Students also can choose independent study options that really speak to their areas of strength." Bertucci makes an important point about the freedom experienced by independent schools—not least, freedom from standardized assessments and imposed curricula. But many public educators are also cognizant of Gardner's work and strive to implement it. New Paltz School District Superintendent Maria Rice is a strong Gardner fan, referencing his Five Minds for the Future extensively in a recent communiqué to district stakeholders. "Success will not derive from the archaic demands of federal and state mandates which still require us to teach and test for the past, for the Industrial Age," she says. "Schools have been forced into being tethered to a skills-based, test-driven educational process that extols the mastery of facts and formula rather than encouraging thinking and creativity." In New Paltz, she states firmly, the goal is to facilitate students in becoming world citizens by whatever means necessary. So if educators universally comprehend this, why the disconnect between common wisdom and what many see as onerous top-down assessment-driven climate? Indeed, search "multiple intelligence" on the New York State Education website and you'll find absolutely nothing. GBRSS's Greene has an inkling: "I believe that public educators are approaching the same values with a different toolbox," he says. "And at the moment there is a disconnect between capitalism and democracy that's impairing that." At the other end of the spectrum, one might say, lies the Hudson Valley Sudbury School, where students aren't just offered individualized learning—they design their own, and do nothing they do not want to do. "Gardner's work is interesting in the abstract sense, but it doesn't so much affect what we do," says co-founder Jeff Collins. "The kids are part of all decision-making and judicial processes, they're respected and given choices in what to learn and how. We reject the dichotomy that there are two types of activities: beneficial and not. We value every activity—every activity has aspects of learning and aspects of not learning to it. We don't say, 'Okay, here's recess, that's fun, now it's time to sit down and learn, which is not fun.' We want them to enjoy themselves and flourish, not segment time into 'valuable' and 'unvaluable'—it's a whole other paradigm that's scary in some ways." Sudbury outcomes, he says, look much like any other school's, with the exception that Sudbury students tend to lean toward entrepreneurial pursuits "and they tend to only go to college if it's what they really want, not because they're 'supposed to.'" 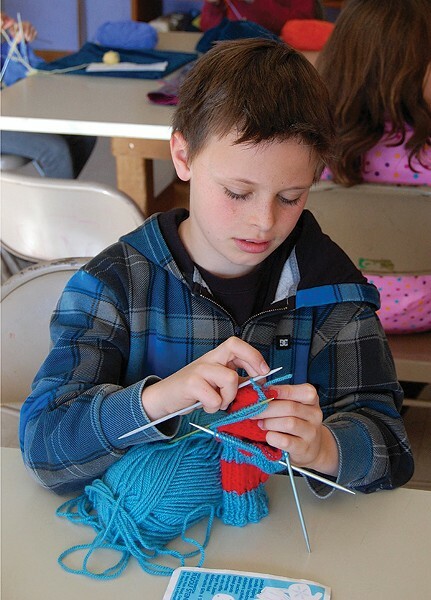 The Great Barrington Rudolf Steiner School’s projects knit together the multiple intelligences. Gardner has always been careful to describe himself as a psychologist first and foremost, and largely left to others the question of how best to apply his discoveries in the classroom—although he does caution against confusing multiple intelligences with "learning styles," saying that the MI theory is more a delineation of basic equipment, and styles are more a matter of how it's put to use. 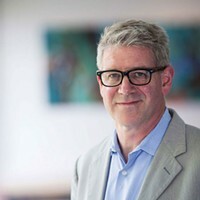 Since publication of Frames of Mind, he's gone on to identify the possibility of another innate intelligence—existentialist—and publish further works, the most recent one being The App Generation: How Today's Youth Navigate Identity, Intimacy, and Imagination in a Digital World, an exploration of the difference between being "app-dependent" and "app-enabled." But while the questions of pedagogical method he refuses to weigh in on are more numerous than those he'll answer, he makes one thing perfectly clear: "I personally prefer a school in which a range of discipline and skill areas are a regular part of the curriculum, and I dislike a school with a narrow focus on any intelligence, be it a traditional academic school or an arts-centered school," he said in an online chat at Thirteen.org. Which would seem to be a message that Hudson Valley educators are hearing loud and clear.